Beautiful,fluffy, adorable dog-ghters and best friends FUR-ever are available here!!! We usually always havePomeranian puppies: my daughters, fiance, aunt, uncle, brother, mother, friends, and myself all are happy pet owners! With nearly 30 years of breeding dogs in our combined experience, our dogs are gentle pets whose job is none other than to be our life's companion, be supremely spoiled by loving care, and to keep our laps warm for their lifespan. Contact me (Sheri) 417-207-0760 (LOVE TEXTING) or MY MOTHER, Jean: (417)259-2800. *The puppies that belong to my mother/family follow the same pricing/other guidelines as my dogs. POMS: Prices vary according to size, age, registration type, and color. 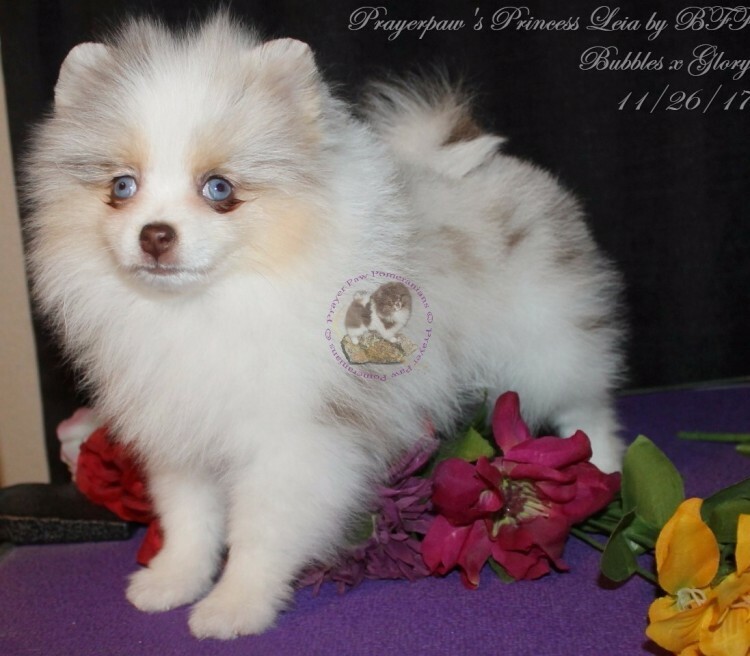 Most of our Poms are AKC registered, but we do have a couple of ACA registered Poms.WE also specialize in unusual or rare colors, but we do also have the traditional colors. Most of our Poms are partis or parti-factored. ​​ Shipping:will be extra. We have two options: #1 - Commercial Flight; #2 Ground Transportation. ****#1 - Most of our ​​Pomeranians are shipped by commercial flights. I can ship for approximately $250.00 for puppies under three months of age in most areas in the continental U.S.A. (I believe I can ship to Canada or Alaska for an additional $50.00.) This includes your crate, health certificate, insurance, and flight cost! I do ask that you pay the 3% of the bill and the $.50 cent per transfer fee if you use Paypal. **$50 more if dog is three months or older (see paragraph below). 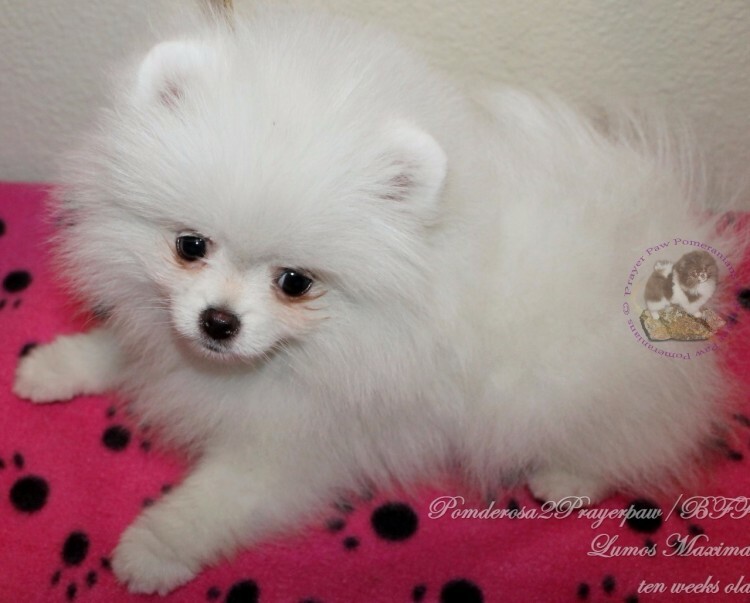 ​****If the Pomeranian puppy you buy is extremely small (weighing less than 1.5 pounds at 8 weeks), I will ask you to let me hold on to it for a couple of extra weeks. I will ship it if you insist, but it is much better on the puppy if you wait until they are a more sturdy weight (two pounds)! If you buy a smaller end Pom, please have Nutri-Cal on hand to feed in case of Sugar Shock (hypoglycemia) situations. It is best to feed it to your new puppy immediately after your arrival home. A mixture of peanut butter and honey is similar if you do not have Nurti-Cal or similar product on-hand. **​ **If I hold the puppy until 12 weeks of age and have to ship, I charge an additional $50 for a rabies vaccination and a third Parvo shot that are required by law. PAYMENTS: I accept cash, money orders, or personal checks (with no extra fee on my end), BUT I will wait until that clears my bank before I will ship/release the puppy - plan on a week for clearance - OR you can use Paypal (you pay the 3% + .50 per transaction fee) for immediate shipping/release of your puppy. **I believe you can also accept the charges (a current option) when sending money via Paypal. If you pick up the puppy, cash is accepted - NO CHECKS - unless you have sent payment to me prior to pick up, and it has already cleared my bank. ****Your puppy must be PAID IN FULL by the time it is 10 WEEKS OLD. If it is not paid for in full by that time, we will relist the puppy, and you WILL NOT BE REFUNDED ANY MONEYS paid towards the balance. ​​*We WILL hold a puppy up to twelve weeks under extinuating circumstances (the puppy is too small to ship or personal issues), but we must have received the full payment by the puppy's tenth week of age. (There is an additional fee for puppies at twelve weeks of age to ship) - see shipping paragraph. TO HOLD: A $200.00 nonrefundable deposit is required. This can be cash given to me by hand, a money order by mail, or Paypal ($6.50 - 3% plus the .50 transfer fee = total transaction of $206.50). The deposit pays for the Hold Service but DOES go towards the total price due on the puppy. (Only the $200 deposit goes towards the total if using Paypal). If you back out on purchasing the puppy, you will not be reimbursed for the deposit. *****​​*Why do we require a deposit to hold? I am a trusting individual and have lost many a sale because someone told me they definitely wanted the puppy, and I took them at their word. I didn't sell the dog to someone else when I could have and was left holding the bag when the "first" person didn't come through. If you're seriously interested, the $200 is insurance for both you and me. I won't sell the dog if I have that, and I'm pretty sure you won't back out as well. ​ALL PUPPIES ARE PET QUALITY! I have a very good health care system - all puppies and adults are wormed, vaccinated, dipped, and treated for ear mites. They also come with full papers (not limited) unless otherwise stated in our agreement. ​Welcome to Missouri’s own Pomeranian paradise. With around thirty years of combined breeding experience, BFF and Prayer Paw Puppies have both made quite a name for themselves raising the furriest Pomeranian friends around. Whether you’re down the road or one-thousand miles away, we’ll proudly have our puppies delivered to loving families eager for their newest member. As original descendants of dogsled breeds, Pomeranians are active, agile, and humble puppies looking to be loved. That’s why BFF and Prayer Paw Puppies always make it a point to raise each of our Pomeranians on an individual and intimate basis from the very beginning. Even more, since this breed especially needs to feel loved and embraced as young puppies, it is our utmost concern they maintain our high caliber of care long after leaving our home. Every day, it’s with great pride that we present BFF and Prayer Paw Puppies to the world! Although most of our Pomeranians differ in size and color, we promise these puppies maintain a universal standard of adorable. That means you are more than welcome to visit us and find the perfect Pom Pup for you! For any additional information, please contact Jean with BFF Puppies at (417) 259-2800 (nderson@hughes.net) or Sheri with Prayer Paw Puppies at (417) 207-0760 (prayerpawpuppies@yahoo.com). You are welcome to text, call, or email us. Have a wonderful day, and we look forward to speaking with you! My mother and I each have a licensed kennel. Friends who have purchased from us and other family members (brother, uncle, aunt, children, etc.) list on our website as well. *All puppies follow the pricing standards listed below. PLEASE READ CAREFULLY, as our policies,terms, and conditions are listed here. *​For BFF/Prayer Paw Puppies HEALTH GUARANTEES and sales agreement, please visit "Contract BFF/PPP" page. These conditions and guarantees ONLY apply to dogs/puppies sold by Sheri of Prayer Paw Puppies and Jean of BFF Puppies. If anyone else has a pup for sale on our site, you MUST contact THAT person for their guarantees, etc. ​​MICROCHIPPING: We now microchip upon request for a fee of $25.00. PRICING:This will vary due to the owner selling. Also, the puppy’s size, color, registration type, and coat are considered in the pricing guidelines. 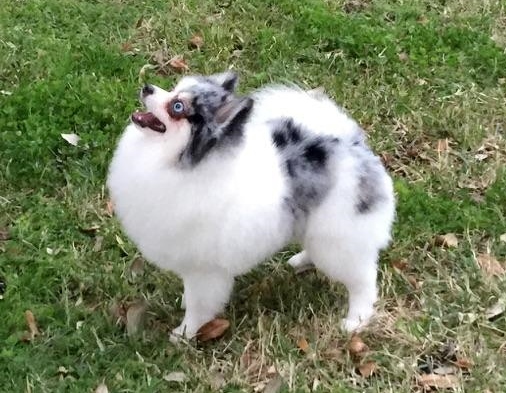 Smaller end Poms and rare coat colors are usually more expensive. SHIPPING: This service is extra – above the price of the puppy. OPTION 1: ​ We typically charge $250 to most places in the continental USA with Delta or American Airlines (Pet Safe). With United Airlines PET SAFE, it's $325 - $350. Two puppies in one crate takes a bigger sized crate and will be $300 minimum (contact us for price). *Prices are subject to changed based on the airline prices. We can ship to Canada or Alaska, but the rates are higher. Beyond this, we do not ship out of the USA. This fee includes the crate, flight cost, and health certificate. Puppies that are not delivered via our shipper (Tuesday shipping) will be a higher cost - or if your area lies outside of our shipping perimeter. Please ask for a price quote before committing to buy! ​OPTION 2: I have a puppy nanny service on occasion, but it is not available to all areas in the United States. She USUALLY charges in the $500 ballpark, depending on the trip. ***Puppies shipped at 12 weeks of age or later must have additional vaccinations: a third Parvo and a Rabies shot – required by law. We charge an additional $50 for puppies we hold past ten weeks to cover these fees in addition to our time spent for your puppy's care, cleaning, feeding, worming, etc. HOLD SERVICE: We require a $250 NONREFUNDABLE/NONTRANSFERRABLE deposit to hold your puppy which pays for us to reserve your baby and stop advertising his/her sale. This is insurance for both of us. You are making a serious promise to buy the puppy, and we are giving our word that we won’t sell the puppy to someone else. The hold service DOES go towards the total bill owed, but cannot be transferred to another puppy, nor will it be refunded if you change your mind. *​We share our selling website with friends/family. I don’t want to think I sold a puppy just to find out that person changed their mind and wants one of my mom’s. Please be SURE of the puppy you want before placing a deposit. PAYMENT: We prefer receiving funds electronically (Walmart to Walmart or Western Union). We DO tack on the fees that would come out of our end if you choose a payment option that causes us to pay fees. These we will request from you, and you cannot use someone else's account to pay for a puppy. All accounts must be in the purchaser's name or the other person must also sign the contract. We also accept cash, money orders, and cashier's checks with no extra fees on our end, but the money order/cashier's check MUST clear our bank before the puppy can be released from our possession. ***PUPPY PICK UP = CASH ONLY - No money orders/cashier's checks will be accepted UNLESS it has been shipped to us over a week in advance and has cleared our bank – (This is for puppies with no shipping required). ****ALL PUPPIES MUST BE PAID IN FULL BY 10 WEEKS OF AGE!!!! If you have NOT paid fully for your puppy by this time, you will LOSE any moneys paid. We will relist the puppy, and you WILL NOT BE REFUNDED ANY MONEYS PAID towards the balance due. We WILL hold a puppy for you until 12 weeks of age, if needed (the puppy is too small to ship or you have extenuating circumstances), provided the full balance is paid by the time the puppy is 10 weeks. There WILL be an additional fee of $50 to pay for vaccinations for puppies kept over eleven weeks (see shipping paragraph). ***ONLY IF APPROVED BY OWNER IN WRITING and there are VERY special circumstances will we hold puppies for more than 12 weeks. There is an additional charge of $20 a week beyond the first 12 weeks for puppies remaining with us. We must pay for additional worming, care, cleaning, food, and space needed. We sell puppies at 8 weeks and do not plan to accommodate puppies older than this. *​​See our MENU options, including our puppy GUARANTEES, for additional information​​​.